Though Samsung has been tight lipped about the upcoming Galaxy S5, a lot has already been said and written about the device. A fresh round of leaks from @evleaks further add to the speculation. The upcoming phone, which would be the fifth iteration of the flagship S series, will carry the name Galaxy S5. 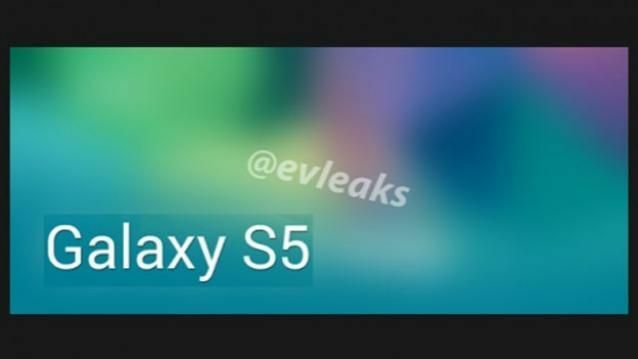 Several specs such as 16MP camera, WQHD display and also the fingerprint scanner have already been floated about in our rumour round-up of the Galaxy S5. And now evleaks has furnished more evidence of their presence. The prolific tipster – with a successful track record of leaking information about unreleased phones – revealed two APK files with the names 3DTourViewer_WQHD_K.apk, and Fingerprintservice.apk, suggesting at least two new features will be see in the upcoming phone. The very first rumour that surfaced about the Galaxy S5 was its QHD display and this has been a constant throughout all the speculation. The S5′s display is likely to have a resolution of 2560×1440 pixels. evleaks also revealed the first picture sample taken from the S5. The photo matches up to the rumoured 16MP camera of the S5, although the picture itself doesn’t say much. Right on the heels of the recent rumours that claim Samsung has ditched its iris scanner technology (for good); evleaks’ APK reveal further confirms that Samsung will be opting for a fingerprint scanner instead. Samsung is also rumoured to redesign TouchWiz, and give it a complete Google Now-kind of facelift, but all that could change by the time the S5 comes around. That could very well happen next month at the Mobile World Congress with an expected April launch date.